Continuing from the previous article in which I showed how to use an Eclipse wizard to create a web service client given just the URI of the WSDL, I am going to use JAXB, the Java Architecture for XML binding. Marshalling is mapping XML elements to object properties so that each element of an XML String of data can be ‘injected’ into the properties of an object. Unmarshalling is the opposite. The flattening of an object to an XML String. 1. To get started I am going to create a new package that will contain the classes related to marshalling the XML, I call it demo.webservice.marshal. I will need a class that performs the marshalling (StockQuoteMarshaller.java), classes that represent the XML in object form (StockQuotes.java and Stock.java) and a utility class to make the call to the web service (XMLStockQuote.java). Let’s start with the classes that represent the XML. The classes that represent the XML in object form will be determined by the structure of the XML, so lets examine the XML. Fortunately the XML is quite simple and consists of a parent element (StockQuotes) that contains one dependent child element (Stock). So I create a class structure representing this relationship. We can represent this in object form as follows. and the Stock object as follows. As can be seen the StockQuotes object has one dependency the Stock object. 2. Now that we have the class structure created we must create the setters and getters and map the properties in the classes to the elements in the XML. 3. The first task is to map the root element of the class to the root element of the XML. We use @XmlRootElement to map the root element of the class to the root element of the XML, the root element is the class name StockQuotes. 4. Now we continue by mapping the properties in the classes to the elements in the XML using the @XmlElement annotation. In the StockQuote class we annotate the class name as the root element and map the getStock() getter method to the element Stock in the XML. Note how I have used a name on each element. This is not strictly necessary if the name of the property is the same as the name of the XML element. I do it here for completeness. Also it is legal to put the annotation on the property instead of the getter method. 5. We do the same with the Stock class and annotate the getter method for each XML element we want to map. 6. That’s the hard part over. To finish we need two more classes. One class to marshal (or unmarshal in this case as we transform from XML to object) and another to call the webservice code from step 1 and returns the XML. I will write the unmarshalling method as static because it is a utility method that we call to perform a function. Create a new class called StockQuoteMarshalling.java with the following code. 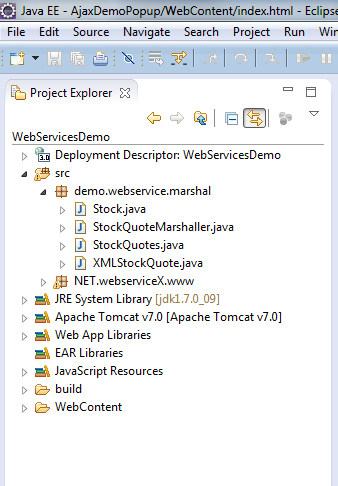 Now for the utility method that calls the webservice code from step 1 and returns the XML. Create a class XMLStockQuote.java with the following code. The getXMLForCode accepts a stock as the only parameter. This code originates from the request object processed by the servlet (which we create in step 3). Now we need to create the servlet and JSP template.